The large slider indicates the current light level at a glance. 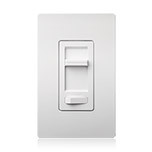 The switch automatically returns the room's lighting to the user's favorite preset level. The C•L models with HED Technology improve dimming performance of dimmable CFLs and LEDs compared to standard dimmers.